Flyers left winger Oskar Lindblom skates against the Vegas Golden Knights on Saturday before being injured in the third period. Vegas won, 1-0. Midway through Saturday's third period, Flyers left winger Oskar Lindblom was slammed face-first into the boards by Vegas defenseman Brayden McNabb and didn't return to the game. It wasn't as bad as it looked because Lindblom, after the team's off day Sunday, was able to practice Monday, and he will be in the lineup Tuesday night against Aleksander Barkov and visiting Florida. 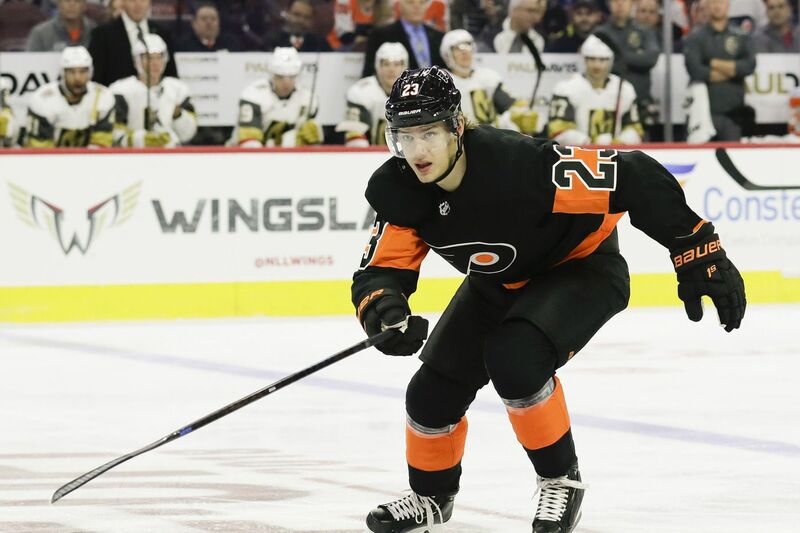 The Flyers are already missing injured forwards James van Riemsdyk (knee) and Nolan Patrick (upper body). Losing Lindblom would have added to their misery. "After the hard hit, I felt a little shaky, but I got a good day off and I felt like I came back to normal pretty quick," Lindblom said after Monday's practice in Voorhees, where he was on a line with Jordan Weal and Travis Konecny. Lindblom took some of the responsibility for McNabb's jarring hit. No penalty was called. Vegas won the game, 1-0, on a late goal. "He was close to me and I turned around a little, but when he tried to hit me, I need to be ready for that, too," Lindblom said. "I can't just blame him." Lindblom passed all concussion tests. Now, he and his linemates will try to cash in on their scoring chances Tuesday that they couldn't finish against Vegas. That line, which had Weal replacing Patrick, "had a lot of good moments in that hockey game, especially in the first half of the game," coach Dave Hakstol said. "They have an opportunity to go in and build on that chemistry and be a little bit better in Game 2 than they were in Game 1." "We had a couple of good scoring chances and almost had open nets," said Lindblom, who hasn't scored since netting the Flyers' first goal of the season. "We just have to get to those hard areas and get a greasy one. … I think it's a matter of time and we just need a little bounce to be with us. I feel like we're working hard and we're good defensively. We still have to work hard and do the gritty work out there." Jake Voracek Chia Pets will be given to Flyers fans Tuesday. Fans attending Tuesday's game against Florida (0-2-1) will be given Jake Voracek Chia Pets. They appear to have the plants growing as Voracek's beard. "I'm not going to have one at home — that's for sure," Voracek said. "I don't think my girlfriend would appreciate that." Hakstol wondered why he didn't get an order form for the pet. "I'm crushed at that," he deadpanned. Florida's Mike Matheson, a second-pairing defenseman, was suspended for two games Monday for interference and unsportsmanlike conduct Saturday against Vancouver's Elias Pettersson…..Patrick and Samuel Morin (knee) skated before practice. Patrick will probably return Thursday in Columbus or Saturday against visiting New Jersey, and Morin isn't expected back until February. … Hakstol was pleased with his team's all-around effort in Saturday's 1-0 loss to goalie Marc-Andre Fleury and Vegas, but added, "We can execute a little bit better. Not on the five or six highlight-reel saves their goaltender made, but in other areas. We can shoot the puck a little more, especially early in the hockey game, to establish a little more in the offensive zone. We can have a couple individual players play better."